What is a SF-15 Form? A SF-15 form is used by various Federal agencies and Office of Personnel examining offices. SF-15 Form: What Is It? A SF-15 form is used by various Federal agencies and Office of Personnel examining offices. It will verify whether a person is eligible for veteran's benefits. 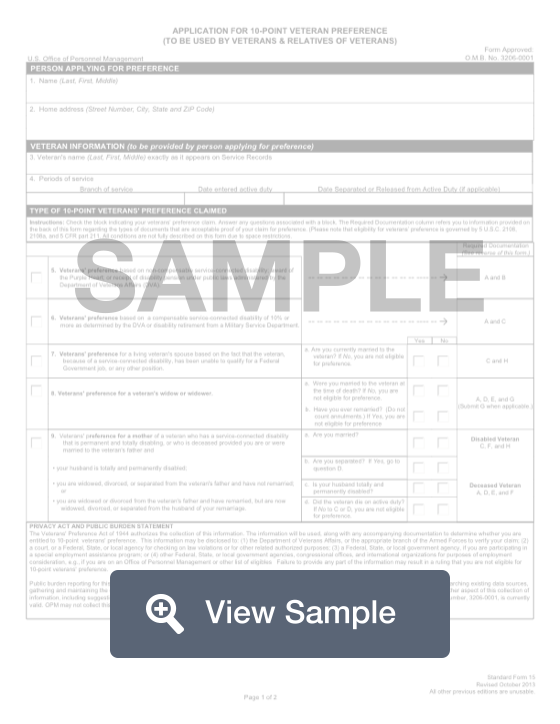 This form has been used since the Veterans' Preference Act was instated in 1994. A veteran will be the one who fills out the form. They will use it to apply for various veterans' preferences for things like employment. The veteran will need to list what kind of preference they are applying for. This could be for direct eligibility, the spouse of a military veteran, or a veteran's widow. Veterans must meet certain qualifications in order to be eligible for veterans' preferences. They must be a military retiree, or they must have been honorably or generally discharged. Disabled veterans need to include this information as well, as they may be eligible for more benefits. Create a free SF-15 Form in minutes with our professional document builder.